Nagel 30, Fornidar 9 x 12cm Plate Camera. The subject of this restoration was acquired in 2005. A casual glance suggested that it was mostly in order but upon closer scrutiny the poor old thing was suffering from serious corrosion and it was relegated to the spares bin for scrapping or later restoration. In December 2007, the restoration queue was empty so the Fornidar was retrieved from the box. Every time the camera was handled a stream of aluminium oxide would cascade out from various recesses. The camera was impossible to use as this dust would find its way onto the film. 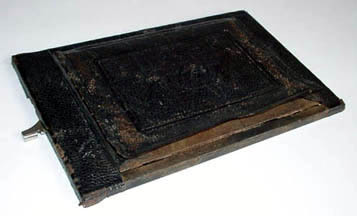 The carcass was severely corroding beneath the remains of the leather covering and the lensboard was badly rusted too. The shutter was very dirty and was corroded to its lock ring. The good news was that the bellows looked salvageable and the lens bed paint, though a bit battered was worth conserving. With the camera now in bits each component was checked as to whether it could be conserved or would need to be restored . The focus screen hood needed a replacement linen hinge. Here the leather has been peeled back and the metal work cleaned. All the leather work was saved and subsequently given a coat of Venetian Cream, and polished after the new hinge was glued in place. The metalwork was cleaned, as the original surface finish was tolerable. The original mounting plate was badly corroded however and was stripped and resprayed. All the paint, including the scratches was retained on the lensboard and focus rack. 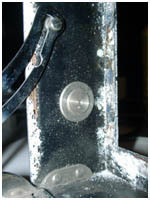 The aluminium lensboard support struts were enamel panted on their outer edges, but the inner sides were left as they were - as they were in good condition, the difference cannot be distinguished. The lensboard itself was very badly corroded and needed to be stripped and resprayed. The waist level finder was repainted and a replacement lens came from a 1935 Kodak that obviously used the same stampings. The bellows needed a small patch to a hole, created by parring back some cured goat skin skiver until it was paper thin. The edges are then further feathered off to nothing and the piece glued over the hole. For this we use slightly thinned PVA, which is slightly rubbery and remains flexible enough after drying, the repair is all but invisible and fortunately in this case is on the bottom and inside the case. At right, the camera has been reassembled and the new paper template for the replacement leather covering is being test fitted to make sure the various slots and cuts will line up correctly. 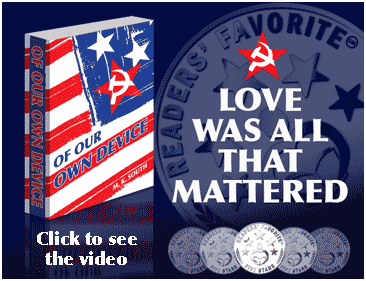 In production the leather would have been stamped with metal dies to put the pattern in. For one offs wooden dies will suffice and will usually survive half a dozen impressions. Two were required for this Nagel, using thin strips of mahogany and spruce obtained from a model shop. The leather is damped from behind and the die held in compression with a couple of 'G" clamps for half an hour for each impression, leaving a crisp impression. The restored carcass with the original leather covering restored to the front, the original leather handle refitted after treatment and the new leather work around the sides. 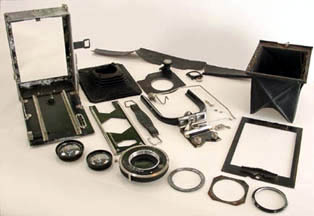 A distinctive styling feature of Nagel cameras is a silver edge around the hatch and other components. Finally before and after images of the finished camera is see below after it's mixture of repair, restoration and conservation. Now fully functioning, the Compur has been serviced and all speeds and delayed release operate smoothly after the unit was dismantled and cleaned. This process included polishing out spots of rust from the blued spring steel shutter leaves. There just remains the task of refurbishing two plate carriers then slicing the edges off some 5x4" film to create the required plate size and the Fornidar is back in business.